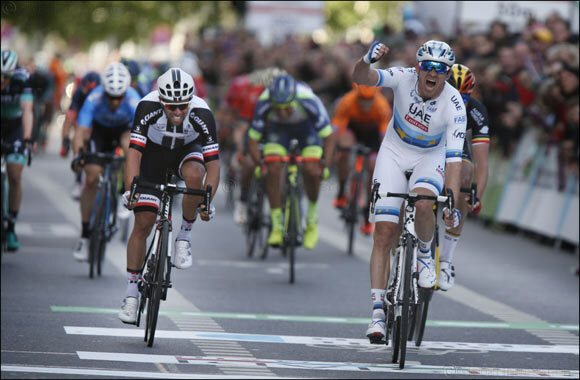 Dubai, UAE, May 02, 2018: UAE Team Emirates’ Alexander Kristoff reigned supreme at Eschborn-Frankfurt and in doing so, claimed his fourth consecutive title at the historical one day race in Germany. His dominant show of strength not only earned him a top podium position, but also a place in cycling’s record books. The European Champion has now won the UCI World Tour race more times than any other rider and can add this victory to the stage wins he achieved earlier this season in Oman and Abu Dhabi. Despite a change in the 212km route – designed to make it more difficult for the sprinters – Kristoff battled hard throughout the climbs, putting himself in the perfect position in the final 300m to out-sprint his rivals, take home the title and add to his Eschborn-Frankfurt victories in 2014, 2016 and 2017. UAE Team Emirates will now continue their UCI World Tour season at the Giro d’Italia (4-27 May). The team’s participation on the UCI World Tour gives the local community the opportunity to come together and support world-class athletes as they aim to become one of the top cycling teams on the tour. To find out more about UAE Team Emirates, visit UAETeamEmirates.com.